Fate: Torpedoed and sunk on 30 July 1945 by Japanese submarine I-58. About 900 of the 1,196 crewmen aboard initially survived; by the time they were rescued, only 321 remained, four of whom soon died. USS Indianapolis (CA-35) was a Portland class heavy cruiser of the United States Navy. She was named for the city of Indianapolis, Indiana. She was flagship for Admiral Raymond Spruance while he commanded the Fifth Fleet in battles across the Central Pacific. Her sinking led to the greatest single loss of life at sea in the history of the U.S. Navy. On 30 July 1945, after delivering parts for the first atomic bomb to the United States air base at Tinian, the ship was torpedoed by the Imperial Japanese Navy submarine I-58, sinking in 12 minutes. Of 1,196 crewmen aboard, approximately 300 went down with the ship. Indianapolis was the second of two ships in the Portland class; third class of "treaty cruisers" constructed by the United States Navy following the Washington Naval Treaty of 1922, following the two vessels of the Pensacola class ordered in 1926 and the six of the Northampton-class ordered in 1927. Ordered for the U.S. Navy in fiscal year 1930, Indianapolis was originally a light cruiser, given the hull classification symbol CL-35, being re-designated a heavy cruiser with the symbol CA-35 on 1 July 1931, in accordance with the London Naval Treaty. As built, the Portland cruisers were to be 610 feet 3 inches (186.00 m) in length overall, and 592 feet (180 m) long at the waterline, 64 feet 6 inches (19.66 m) abeam, and with a draft of 21 feet (6.4 m) (24 feet (7.3 m) maximum). They were designed for a standard displacement of 10,258 tonnes (10,096 long tons; 11,308 short tons), and a full-load displacement of 12,755 tonnes (12,554 long tons; 14,060 short tons). However, when completed she did not reach this weight, displacing 9,800 tonnes (9,600 long tons; 10,800 short tons). The ship had two distinctive raked funnels, a tripod foremast, and a small tower and pole mast aft. In 1943, light tripods were added forward of the second funnel on each ship, and a prominent Naval director was installed aft. The ship had four propeller shafts and four Parsons GT geared turbines and eight Yarrow boilers. The 107,000 shaft horsepower (80,000 kW) gave a design speed of 32 knots (59 km/h) She was designed for a range of 10,000 nautical miles (19,000 km; 12,000 mi) at 15 knots (28 km/h). She rolled badly until fitted with a bilge keel. 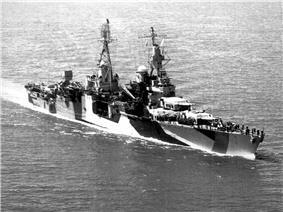 The cruiser had nine Mark 9 8"/55 caliber guns in three triple mounts, a superfiring pair fore and one aft. For anti-aircraft defense, she had eight 5"/25 caliber guns and two QF 3 pounder Hotchkiss guns. In 1945, she received 24 Bofors 40mm guns, arrayed in six quad mounts. Both ships were upgraded with twelve Oerlikon 20 mm cannons. No torpedo tubes were fitted on her. The Portland class was originally had 1 inch (25 mm) armor for deck and side protection, but in construction they were given belt armor between 5 inches (130 mm) (around the magazines) and 3.25 inches (83 mm) in thick. Armor on the bulkheads was between 2 inches (51 mm) and 5.75 inches (146 mm); that on the deck was 2.5 inches (64 mm), the barbettes 1.5 inches (38 mm), the gunhouses 2.5 inches (64 mm), and the conning tower 1.25 inches (32 mm). Portland-class cruisers were to be outfitted as fleet flagships, with space for an admiral and his staff. The class also had an aircraft catapult amidships. They could carry four aircraft. The total crew varied, with a regular designed complement of 807, a wartime complement of 952, which could increase to 1,229 when the cruiser was a fleet flagship. Indianapolis was laid down by New York Shipbuilding Corporation on 31 March 1930. The hull and machinery were provided by the builder. Indianapolis was launched on 7 November 1931 and commissioned on 15 November 1932. She was the second ship named for Indianapolis, Indiana following the cargo ship of the same name in 1918. She was sponsored by Lucy Taggart, daughter of former Mayor of Indianapolis Thomas Taggart. Under her first captain, John M. Smeallie, Indianapolis undertook her shakedown cruise through the Atlantic and into Guantánamo Bay until 23 February 1932. Indianapolis then transited the Panama Canal Zone for training off the Chilean coast. After overhaul at Philadelphia Navy Yard, she sailed to Maine to embark President Franklin Delano Roosevelt at Campobello Island in New Brunswick on 1 July 1933. Getting underway the same day, Indianapolis arrived at Annapolis, Maryland on 3 July. She hosted six members of the Cabinet along with Roosevelt during its stay there. After disembarking Roosevelt, she departed Annapolis on 4 July, and steamed for Philadelphia Navy Yard. On 6 September, she embarked Secretary of the Navy Claude A. Swanson for an inspection of the Navy in the Pacific. Indianapolis toured the Canal Zone, Hawaii, and installations in San Pedro and San Diego. Swanson disembarked on 27 October. On 1 November 1933, she became flagship of Scouting Force 1, and maneuvered with the force off Long Beach, California. She departed on 9 April 1934 and arrived at New York City and embarked Roosevelt a second time, for a naval review. She returned to Long Beach on 9 November 1934 for more training with the Scouting Force. She remained flagship of Scouting Force 1 until 1941. On 18 November 1936, she embarked Roosevelt a third time at Charleston, South Carolina, and conducted a goodwill cruise to South America with him. She visited Rio de Janeiro, Brazil, Buenos Aires, Argentina, and Montevideo, Uruguay for state visits before returning to Charleston and disembarking Roosevelt's party on 15 December. On 7 December 1941, Indianapolis was conducting a mock bombardment at Johnston Atoll during the Japanese attack on Pearl Harbor. Indianapolis was absorbed into Task Force 12 and searched for the Japanese carriers responsible for the attack, though the force did not locate them. She returned to Pearl Harbor on 13 December and joined Task Force 11. With the task force, she steamed to the South Pacific, to 350 mi (560 km) south of Rabaul, New Britain, escorting the aircraft carrier Lexington. Late in the afternoon of 20 February 1942, the American ships were attacked by 18 Japanese aircraft. Of these, 16 were shot down by aircraft from Lexington and the other two were destroyed by anti-aircraft fire from the ships. On 10 March, the task force, reinforced by another force centered on the carrier Yorktown, attacked Lae and Salamaua, New Guinea, where the Japanese were marshaling amphibious forces. Attacking from the south through the Owen Stanley mountain range, the U.S. air forces surprised and inflicted heavy damage on Japanese warships and transports, losing few aircraft. Indianapolis returned to Mare Island shipyard for a refit before escorting a convoy to Australia. She then headed for the North Pacific to support American units in the Battle of the Aleutian Islands. On 7 August, Indianapolis and the task force attacked Kiska Island a Japanese staging area. Although fog hindered observation, Indianapolis and other ships fired their main guns into the bay. Floatplanes from the cruisers reported Japanese ships sunk in the harbor and damage to shore installations. After 15 minutes, Japanese shore batteries returned fire before being destroyed by the ships' main guns. Japanese submarines approaching the force were depth-charged by American destroyers. Japanese seaplanes made an ineffective bombing attack. In spite of a lack of information on the Japanese forces, the operation was considered a success. U.S. forces later occupied Adak Island, providing a naval base further from the Dutch Harbor on Unalaska Island. In January 1943, Indianapolis, supporting a landing and occupation on Amchitka, part of an Allied island hopping strategy in the Aleutian Islands. On the evening of 19 February, Indianapolis led two destroyers on a patrol southwest of Attu Island, searching for Japanese ships trying to reinforce Kiska and Attu. She intercepted a Japanese cargo ship, Akagane Maru. The cargo ship tried to reply to the radio challenge but was shelled by Indianapolis. Akagane Maru exploded and sank with all hands. Through mid-1943, Indianapolis remained near the Aleutian Islands escorting American convoys and providing shore bombardments supporting amphibious assaults. In May, the Allies captured Attu, then turned on Kiska, thought to be the final Japanese holdout in the Aleutians. Allied landings there began on 15 August but the Japanese had already abandoned the Aleutian Islands, unbeknownst to the Allies. After refitting at Mare Island, Indianapolis moved to Hawaii as flagship of Vice Admiral Raymond A. Spruance, commanding the 5th Fleet. She sortied from Pearl Harbor on 10 November with the main body of the Southern Attack Force for Operation Galvanic, the invasion of the Gilbert Islands. On 19 November, Indianapolis bombarded Tarawa Atoll and next day pounded Makin (see Battle of Makin). The ship then returned to Tarawa as fire-support for the landings. Her guns shot down an enemy plane and shelled enemy strongpoints as landing parties fought Japanese defenders in the bloody and costly battle of Tarawa. She continued this role until the leveled island was secure three days later. The conquest of the Marshall Islands followed victory in the Gilberts. 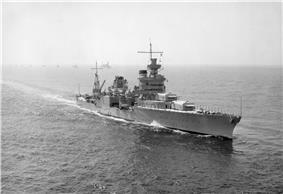 Indianapolis was again 5th Fleet flagship. Indianapolis in 1944 camouflage pattern. In March and April, Indianapolis, still flagship of the 5th Fleet, attacked the Western Carolines. Carrier planes at the Palau Islands on 30–31 March sank three destroyers, 17 freighters, five oilers and damaged 17 other ships. Airfields were bombed and surrounding water mined. Yap and Ulithi were struck on the 31st and Woleai on 1 April. Japanese planes attacked but were driven off without damaging the American ships. Indianapolis shot down her second plane, a torpedo bomber, and the Japanese lost 160 planes, including 46 on the ground. These attacks prevented Japanese forces from the Carolines from interfering with the U.S. landings on New Guinea. In June, the 5th Fleet was busy with the assault on the Mariana Islands. Raids on Saipan began with carrier-based planes on 11 June, followed by surface bombardment, in which Indianapolis had a major role, from 13 June. (See Battle of Saipan.) On D-Day, 15 June, Admiral Spruance heard that battleships, carriers, cruisers, and destroyers were headed south to relieve threatened garrisons in the Marianas. Since amphibious operations at Saipan had to be protected, Admiral Spruance could not withdraw too far. Consequently, a fast carrier force was sent to meet this threat while another force attacked Japanese air bases on Iwo Jima and Chichi Jima in the Bonin and Volcano Islands, bases for potential enemy air attacks. A combined U.S. fleet fought the Japanese on 19 June in the Battle of the Philippine Sea. Japanese carrier planes, which hoped to use the airfields of Guam and Tinian to refuel and rearm, were met by carrier planes and the guns of the Allied escorting ships. That day, the U.S. Navy destroyed a reported 426 Japanese planes while losing 29. Indianapolis shot down one torpedo plane. This day of aerial combat became known as the "Marianas Turkey Shoot". With Japanese air opposition wiped out, the U.S. carrier planes sank Hiyō, two destroyers, and one tanker and damaged others. Two other carriers, Taihō and Shōkaku, were sunk by submarines. Indianapolis returned to Saipan on 23 June to resume fire support and six days later moved to Tinian to attack shore installations (see Battle of Tinian). Meanwhile, Guam had been taken, and Indianapolis was the first ship to enter Apra Harbor since early in the war. The ship operated in the Marianas for the next few weeks, then moved to the Western Carolines where further landings were planned. From 12 to 29 September, she bombarded the Peleliu in the Palau Group, before and after the landings (see Battle of Peleliu). She then sailed to Manus Island in the Admiralty Islands where she operated for 10 days before returning to the Mare Island Navy Yard. Overhauled, Indianapolis joined Vice Admiral Marc A. Mitscher's fast carrier task force on 14 February 1945. Two days later, the task force launched an attack on Tokyo to cover the landings on Iwo Jima, scheduled for 19 February. This was the first carrier attack on Japan since the Doolittle Raid. The mission was to destroy Japanese air facilities and other installations in the "Home Islands". The fleet achieved complete tactical surprise by approaching the Japanese coast under cover of bad weather. The attacks were pressed home for two days. The American Navy lost 49 carrier planes while claiming 499 enemy planes, a 10:1 kill/loss ratio. The task force also sank a carrier, nine coastal ships, a destroyer, two destroyer escorts, and a cargo ship. They destroyed hangars, shops, aircraft installations, factories, and other industrial targets. Indianapolis off Mare Island, on 10 July 1945. Immediately after the strikes, the task force raced to Bonin to support the landings on Iwo Jima. The ship remained there until 1 March, protecting the invasion ships and bombarding targets in support of the landings. Indianapolis returned to Admiral Mitscher's task force in time to strike Tokyo again on 25 February and Hachijō off the southern coast of Honshū the following day. Although weather was extremely bad, the American force destroyed 158 planes and sank five small ships while pounding ground installations and destroying trains. The next target for the U.S. forces was Okinawa in the Ryukyu Islands, which were in range of aircraft from the Japanese mainland. The fast carrier force was tasked with attacking airfields in southern Japan until they were incapable of launching effective airborne opposition to the impending invasion. The fast carrier force departed for Japan from Ulithi on 14 March. On 18 March, it launched an attack from a position 100 mi (160 km) southeast of the island of Kyūshū. The attack targeted airfields on Kyūshū as well as ships of the Japanese fleet in the harbors of Kobe and Kure on southern Honshū. The Japanese located the American task force on 21 March, sending 48 planes to attack the ships. Twenty-four fighters from the task force intercepted and shot down all the Japanese aircraft. Pre-invasion bombardment of Okinawa began on 24 March. Indianapolis spent 7 days pouring 8 in (200 mm) shells into the beach defenses. During this time, enemy aircraft repeatedly attacked the American ships. Indianapolis shot down six planes and damaged two others. On 31 March, the ship's lookouts spotted a Japanese fighter as it emerged from the morning twilight and roared at the bridge in a vertical dive. The ship's 20 mm guns opened fire, but within 15 seconds, the plane was over the ship. Tracers converged on it, causing it to swerve, but the enemy pilot managed to release his bomb from a height of 25 ft (7.6 m), crashing his plane into the sea near the port stern. The bomb plummeted through the deck, into the crew's mess hall, down through the berthing compartment, and through the fuel tanks before crashing through the keel and exploding in the water underneath. The concussion blew two gaping holes in the keel which flooded nearby compartments, killing nine crewmen. The ship's bulkheads prevented any progressive flooding. The Indianapolis, settling slightly by the stern and listing to port, steamed to a salvage ship for emergency repairs. Here, inspection revealed that her propeller shafts were damaged, her fuel tanks ruptured, and her water-distilling equipment ruined. But the Indianapolis commenced the long trip across the Pacific to Mare Island under her own power. After major repairs and an overhaul, Indianapolis received orders to proceed to Tinian island, carrying parts and the enriched uranium (about half of the world's supply of Uranium-235 at the time) for the atomic bomb Little Boy, which would later be dropped on Hiroshima. 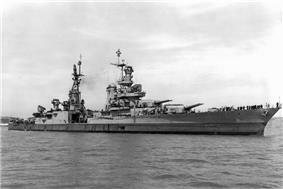 Indianapolis departed San Francisco on 16 July 1945. Arriving at Pearl Harbor on 19 July, she raced on unaccompanied, delivering the atomic weapon components to Tinian on 26 July. Indianapolis was then sent to Guam where a number of the crew who had completed their tours of duty were replaced by other sailors. Leaving Guam on 28 July, she began sailing toward Leyte where her crew was to receive training before continuing on to Okinawa to join Vice Admiral Jesse B. Oldendorf's Task Force 95. At 00:14 on 30 July, she was struck on her starboard bow by two Type 95 torpedoes from the Japanese submarine I-58, under the command of Mochitsura Hashimoto. The explosions caused massive damage. The Indianapolis took on a heavy list, and settled by the head. Twelve minutes later, she rolled completely over, then her stern rose into the air, and she plunged down. Some 300 of the 1,196 crewmen went down with the ship. With few lifeboats and many without lifejackets, the remainder of the crew were set adrift. Navy command had no knowledge of the ship's sinking until survivors were spotted three and a half days later. At 10:25 on 2 August a PV-1 Ventura flown by Lieutenant Wilbur "Chuck" Gwinn and copilot Lieutenant Warren Colwell spotted the men adrift while on a routine patrol flight. Of the 880 who survived the sinking, only 321 men came out of the water alive; 317 ultimately survived. 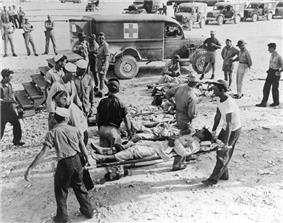 They suffered from lack of food and water (some found rations such as Spam and crackers amongst the debris), exposure to the elements (hypothermia, dehydration, hypernatremia, photophobia, starvation and dementia), severe desquamation, and shark attacks, while some killed themselves or other survivors in various states of delirium and hallucinations. The Discovery Channel stated in Shark Week episodes "Ocean of Fear" that the Indianapolis sinking resulted in the most shark attacks on humans in history, and attributes the attacks to the oceanic whitetip shark species. Tiger sharks might have also killed some sailors. The same show attributed most of the deaths on Indianapolis to exposure, salt poisoning and thirst, with the dead being dragged off by sharks. Gwinn immediately dropped a life raft and a radio transmitter. All air and surface units capable of rescue operations were dispatched to the scene at once. A PBY Catalina seaplane under the command of Lieutenant R. Adrian Marks was dispatched to lend assistance and report. En route to the scene, Marks overflew USS Cecil J. Doyle and alerted her captain, future U.S. Secretary of the Navy W. Graham Claytor, Jr., of the emergency. On his own authority, Claytor decided to divert to the scene. Arriving hours ahead of Doyle, Marks' crew began dropping rubber rafts and supplies. Having seen men being attacked by sharks, Marks disobeyed standing orders and landed on the open sea. He began taxiing to pick up the stragglers and lone swimmers who were at the greatest risk of shark attack. 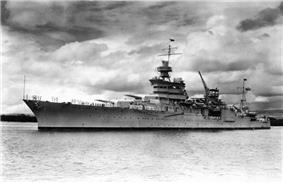 Learning the men were the crew of Indianapolis, he radioed the news, requesting immediate assistance. Doyle responded while en route. When Marks' plane was full, survivors were tied to the wings with parachute cord, damaging the wings so that the plane would never fly again and had to be sunk. Marks and his crew rescued 56 men that day. The Doyle was the first vessel on the scene. Homing on Marks's Catalina in total darkness, Doyle halted to avoid killing or further injuring survivors, and began taking Marks' survivors aboard. Disregarding the safety of his own vessel, Captain Claytor pointed his largest searchlight into the night sky to serve as a beacon for other rescue vessels. This beacon was the first indication to most survivors that rescuers had arrived. The destroyers Helm, Madison, and Ralph Talbot were ordered to the rescue scene from Ulithi, along with destroyer escorts Dufilho, Bassett, and Ringness of the Philippine Sea Frontier. They continued their search for survivors until 8 August. Two of the rescued survivors, Robert Lee Shipman and Frederick Harrison, died in August 1945. Operations plotting boards were kept at the Headquarters of Commander Marianas on Guam and of the Commander Philippine Sea Frontier on Leyte. On these boards, the positions of all vessels of which the headquarters was concerned were plotted. However, for ships as large as the Indianapolis, it was assumed that they would reach their destinations on time, unless reported otherwise. Therefore, their positions were based on predictions, and not on reports. On 31 July, when she should have arrived at Leyte, Indianapolis was removed from the board in the headquarters of Commander Marianas. She was also recorded as having arrived at Leyte by the headquarters of Commander Philippine Sea Frontier. Lieutenant Stuart B. Gibson, the Operations Officer under the Port Director, Tacloban, was the officer responsible for tracking the movements of Indianapolis. The vessel's failure to arrive on schedule was known at once to Lieutenant Gibson, who failed to investigate the matter and made no immediate report of the fact to his superiors. Survivors of Indianapolis on Guam, in August 1945. The Indianapolis sent distress calls before sinking. Three stations received the signals; however, none acted upon the call. One commander was drunk, another had ordered his men not to disturb him and a third thought it was a Japanese trap. 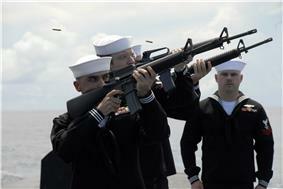 For a long time the Navy denied that a distress call had been sent. The receipt of the call came to light only after the release of declassified records. Immediately prior to the attack, the seas had been moderate, the visibility fluctuating but poor in general, and Indianapolis had been steaming at 17 kn (20 mph; 31 km/h). When the ship did not reach Leyte on the 31st, as scheduled, no report was made that she was overdue. This omission was due to a misunderstanding of the Movement Report System. Captain Charles B. McVay III, who had commanded Indianapolis since November 1944, survived the sinking and was with those rescued days later. In November 1945, he was court-martialed and convicted of "hazarding his ship by failing to zigzag." Several things about the court-martial were controversial. There was evidence that the Navy itself had placed the ship in harm's way, in that McVay's orders were to "zigzag at his discretion, weather permitting." Further, Mochitsura Hashimoto, commander of I-58, testified that zigzagging would have made no difference. Fleet Admiral Chester Nimitz remitted McVay's sentence and restored him to active duty. McVay retired in 1949 as a Rear Admiral. While many of Indianapolis '​s survivors said McVay was not to blame for the sinking, the families of some of the men who died thought otherwise – "Merry Christmas! Our family's holiday would be a lot merrier if you hadn't killed my son", read one piece of mail. The guilt that was placed on his shoulders mounted until he committed suicide in 1968, using his Navy-issue revolver. McVay was discovered on his front lawn with a toy sailor in one hand. He was 70 years old. The day the Indianapolis was sunk was his 47th birthday. In October 2000, the United States Congress passed a resolution that Captain McVay's record should state that "he is exonerated for the loss of Indianapolis." President Bill Clinton signed the resolution. The resolution noted that although several hundred ships of the U.S. Navy were lost in combat in World War II, McVay was the only captain to be court-martialed for the sinking of his ship. In July 2001, the Secretary of the Navy ordered McVay's record cleared of all wrongdoing. Navy firing detail as part of a burial-at-sea in 2008 for one of the 317 survivors of the USS Indianapolis (CA-35) sinking on 30 July 1945. 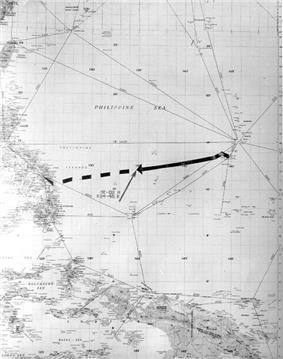 The exact location of Indianapolis is in the Philippine Sea – the coordinates given in this article are for the general area. In July–August 2001, an expedition sought to find the wreckage through the use of side-scan sonar and underwater cameras mounted on a remotely operated vehicle. Four Indianapolis survivors accompanied the expedition, which was not successful. In June 2005, a second expedition was mounted to find the wreck. National Geographic covered the story and released it in July. Submersibles were launched to find any sign of wreckage. The only objects ever found, which have not been confirmed to have belonged to Indianapolis, were numerous pieces of metal of varying size found in the area of the reported sinking position (this was included in the National Geographic program Finding of the USS Indianapolis). The USS Indianapolis Museum had its grand opening on 7 July 2007, with its gallery in the Indiana War Memorial Museum at the Indiana World War Memorial Plaza. The USS Indianapolis National Memorial was dedicated on 2 August 1995. It is located on the Canal Walk in Indianapolis. The heavy cruiser is depicted in limestone and granite and sits adjacent to the downtown canal. The crewmembers' names are listed on the monument, with special notations for those who lost their lives. In May 2011, I-465 around Indianapolis was renamed the USS Indianapolis Memorial Highway. Some material relating to Indianapolis is held by the Indiana State Museum. Her bell and a commissioning pennant are located at the Heslar Naval Armory; the bell was removed to conserve weight prior to her final cruise. The swim training center at United States Navy Recruit Training Command is named USS Indianapolis. References to the Indianapolis sinking and aftermath have been adapted to film, stage, television, and popular culture. The incident itself was the subject of 1991 made-for-television movie Mission of the Shark: The Saga of the USS Indianapolis, with Stacy Keach portraying Captain Charles Butler McVay III. Arguably the most well known fictional reference to the events occurs in the 1975 thriller film Jaws in a monologue by actor Robert Shaw, whose character Quint is depicted as a survivor of the Indianapolis sinking. The monologue particularly focuses on the numerous deaths caused by shark attacks after the sinking. John Milius was specifically brought into the production to write lines for this scene and he based them on survivor stories. However, there are several historical inaccuracies in the monologue; the speech states the date of the sinking as 29 June 1945, when the ship was actually sunk on 30 July, and that no distress call was broadcast, while declassified Navy documents prove the contrary. ^ a b Bauer & Roberts 1991, p. 136. ^ a b c d Bauer & Roberts 1991, p. 138. ^ a b c d e f g h i j Silverstone 2007, p. 32. ^ a b Miller 2001, p. 292. ^ a b Stille 2009, p. 30. ^ a b DANFS 1981, p. 433. ^ a b c d e f g DANFS 1981, p. 434. ^ "Marianas Turkey Shoot". cannon-lexington.com. Retrieved 4 September 2010. ^ "Little Boy," the bomb dropped on Hiroshima, was also inscribed with numerous autographs and graffiti by ground crews who loaded it into the plane. One of them read: "Greetings to the Emperor from the men of the Indianapolis." Richard Rhodes, The making of the atomic bomb (Simon & Schuster, 1986), 710. ^ Lewis L. Haynes (Jul–Aug 1995). "Recollections of the sinking of USS Indianapolis (CA-35) by CAPT Lewis L. Haynes, MC (Medical Corps) (Ret. ), the senior medical officer on board the ship.". Navy Medicine. Retrieved 2009-04-04. ^ "The Sinking of USS Indianapolis: Navy Department Press Release, Narrative of the Circumstances of the Loss of USS Indianapolis, 23 February 1946". U.S. Navy. 23 February 1946. Retrieved 2008-06-16. ^ Timothy W. Maier (5 June 2000). "For The Good of the Navy". Insight on the News. Retrieved 2013-04-15. ^ "Mochitsura Hashimoto". ussindianapolis.org. Retrieved 4 September 2010. ^ "Captain McVay". ussindianapolis.org. Retrieved 4 September 2010. ^ a b Steven Martinovich (16 April 2001). "In Harm's Way"Review of . enterstageright.com. Retrieved 4 September 2010. ^ "Seeking Justice : Victory in Congress". 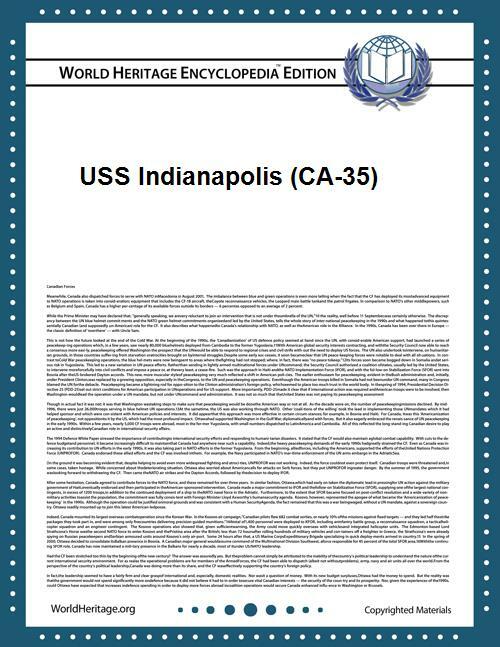 ussindianapolis.org. Retrieved 4 September 2010. ^ "Legislation exonerating Captain McVay". ussindianapolis.org. Retrieved 4 September 2010. ^ Thomas, Joseph (2005). Leadership Embodied. Naval Institute Press. pp. 112–117. ^ Magin, Janis (13 July 2001). "Navy exonerates WWII captain". The Argus-Press. Retrieved 31 July 2011. ^ At USS Indianapolis Museum official website, in the left-hand column, click on "USS Indianapolis Battle Stars". Retrieved 2011-08-17. ^ Indiana War Memorial Museum. State of Indiana official website. Retrieved 2011-08-18. ^ At USS Indianapolis Museum official website, in the left-hand column, scroll down to and click on "Hours of Operation". Retrieved 2011-08-17. ^ At USS Indianapolis Museum official website, in the left-hand column, click on "Mission & Vision". Retrieved 2011-08-17. ^ At USS Indianapolis Museum official website, in the left-hand column, click on "Educational Mission & Traveling Event Museum" and scroll down to "USS Indianapolis Museum / Traveling Event Museum". Retrieved 2011-08-17. ^ Indiana War Memorial: USS Indianapolis Memorial. State of Indiana official website. Retrieved 2011-08-18. Hashimoto, Mochitsura (2010) . Sunk: The Story of the Japanese Submarine Fleet, 1941–1945. New York: Henry Holt; reprint: Progressive Press. Marks, R. Adrian (April 1981). "America was Well Represented". United States Naval Institute Proceedings. Taylor, Theodore (1954). The Magnificent Mitscher. Naval Institute Press. Collection, 1898–1991 (Bulk 1945–1946 and 1984–1991), Collection Guide"Indianapolis"USS . Indiana Historical Society. 13 October 2006. Retrieved 2012-11-02.